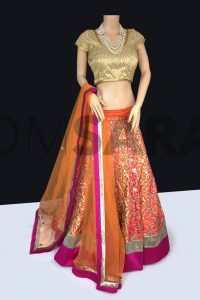 Orange Tomato Red And Blue Lehenga Choli is embroidered belt at waistline with embroidered floral buttis, multicolor self weaving floral pattern all over kalis. The lehenga is finished with green border with resham and zari embroidery with cut work, cording, stone and moti work. The lehenga set comes with a green embroidered silk choli and green silk dupatta with embroidered border and self weaving floral pattern all over.